One of the most significant factors in understanding Paul’s view of Jesus is the fact that he so easily applies “YHWH” texts—OT texts where the God of Israel is the referent—to Jesus. In 1992, David Capes released a book on this topic entitled Old Testament Yahweh Texts in Paul’s Christology. This year (2018), he has released The Divine Christ; a follow-up of sorts that returns to the topic in light of recent scholarship and Capes’ own maturing thoughts. That is not to say, however, that one must read his first book to appreciate this one. This is a solid work on Christology that stands on its own merit. Chapter 1 bergins by considering the Hebrew, Aramaic, and Greek words that lie behind “lord,” “Lord,” and “LORD” in the OT and NT. Additionally, Capes considers how kyrios (“lord”) became the vocalization of YHWH in the Greek translation of the OT. Chapter 2 traces the history of scholarship on the use of kyrios for Jesus. Capes traces the major players such as Wilhelm Boussett, Hahn, Rowlinson, Davies, Hengel, Hurtado, and Casey. In doing so, he raises questions of the relationship between Hellenistic and Jewish churches and if/how this impacted their christology, Jewish monotheism, and others. Chapter 3 considers Paul’s use of kyrios for Jesus. 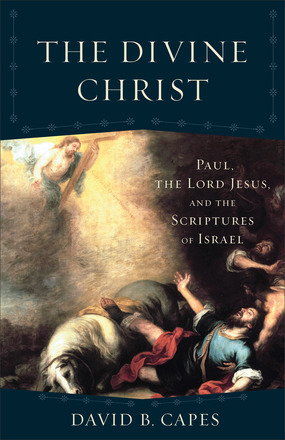 Capes argues that Paul does not use kyrios indiscriminately but in three specific contexts: “ethical statements when Jesus’s authoritative status is on display, in matters pertaining to eschatology, and in instruction concerning the church’s worship or its liturgy” (p. 56). Chapter 4 examines Paul’s “patrological” (referring to the Father) uses of YHWH texts. Capes finds that Paul uses kyrios for the Father in special contexts: justification, election, wisdom, the inclusion of the gentiles, and in describing the church as God’s temple. Chapter 5 closely examines Paul’s “christological” (referring to Christ) uses of YHWH texts in quotations (Rom 10:13; 14:11; 1 Cor 1:31; 2 Cor 10:17; 1 Cor 2:16; 1 Cor 10:26) and allusions (1 Cor 10:21, 22; 1 Thess 3:13; 4:3; 2 Cor 3:16; Phil 2:6-11). Capes concludes that Paul uses YHWH texts for Jesus in the following contexts: the universality of the Gospel, eschatological judgment, the resurrection of Jesus, ethics, divine wisdom, the Lord’s Supper, the role of the Spirit, and Paul’s apostolic authority. Chapter 6 considers the implications for Paul’s use of YHWH texts for Jesus. There are those who question its significance in light of other Second Temple texts that appear to use the divine name in similar ways (11QMelchizedek, 4Q167). However, Capes concludes that Jesus was understood in a unique way; as sharing in the identity of YHWH. Capes suggests that the catalyst for this belief was likely due to the teachings of Jesus in accord with belief in his resurrection. While The Divine Christ originated as a chance for Capes to reconsider and update his argument, it succeeds as a clear, well-argued, and concise introduction to “YHWH Christology.” This Christology provides one of the strongest lines of argument for Jesus’ divinity. I would not hesitate to recommend The Divine Christ to anyone interested in the subject with some background in Biblical studies. It will benefit both teachers and students. Buy The Divine Christ and a percentage Supports My Digital Seminary. Many thanks to Baker Academic for providing a copy in exchange for review.